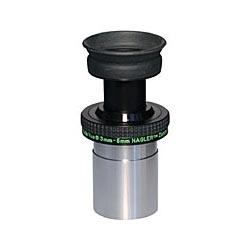 The Televue 3mm - 6mm Nagler Click-Stop Zoom has a 1.25" barrel size to fit 1.25" focusers, adapters, diagonals or accessories. With 3, 4, 5, and 6mm settings, it's like having four Nagler eyepieces in one! The Televue 3mm - 6mm Nagler Click-Stop Zoom has 10mm of eye relief and a great 50º apparent field of view. The Televue 3mm - 6mm Nagler Click-Stop Zoom features full multi-coating, blackened lens edges, fold-down eyeguard, rubber grip-ring, safety undercut, anti-reflection threads and filter threads. This high performance, high-contrast, high power eyepiece is ready to take it's place among the best planetary eyepieces available....but with a "Nagler" twist. Al has incorporated his proven "Nagler" concept into a zoom, while optimizing for the performance factors critical to planetary observers: contrast, resolution, and comfortable eye relief. The Tele Vue Nagler Zoom is tack-sharp across its constant 50º apparent field, and throughout its 3mm-6mm focal length range, even in fast APO scopes. The 3mm-6mm Nagler Zoom is parfocal throughout its zoom range, parfocal with other Televue 1-1/4" eyepieces, and has a constant 10mm eye relief. Weight is only 0.3 lbs. And, as seemingly unbelievable as it all sounds, the design includes just 5 elements in 3 groups. In case you're not counting, that's the same number of all-glass surfaces found in a Plossl or Ortho, plus a barlow! Why did Televue design this eyepiece? By dialing in the best balance between magnification, exit pupil size, and atmospheric turbulence, the critical planetary observer can find the best possible image for the observing conditions. The new 3mm-6mm Nagler Zoom features Click•Stops at 3, 4, 5, and 6mm, full multi-coating, blackened lens edges, fold-down eyeguard, rubber grip-ring, safety undercut, anti-reflection threads and filter threads. May the "degrading zoom" mythology rest in peace!